All of a sudden it feels like kale is everywhere I look! And for good reason, this antioxidant rich food has been deemed the "queen of greens". My favorite incarnation, Juice Generation's 'Hail to Kale' which blends kale with watermelon, apple and lemon. Give 'Hail to Kale' a whirl after a trip to the gym or a spin class for a super healthful DAY! After the big meal it's customary to serve coffee. But the last thing I want to do is serve another course!iSo I've started setting up a coffee bar each year instead. Clear off a bar cart of everything but an electric coffee maker, some cups and saucers, sugar, spoons, and napkins and let your guests help themselves. For fun you might want to include a bottle of Irish Whiskey and a recipe for Irish Coffee to keep the festivities going! If you're looking for something to tide over your guests before the turkey hits the table these delicious muffins are the prefect snack. Low-fat and holiday themed they also serve as a great breakfast for house guests or early morning kitchen helpers. And at less than 200 calories per muffin you won't have to worry about wasting any calories before the big meal. Preheat oven to 350 degrees. Coat a muffin pan with nonstick cooking spray. In a large bowl, combine flour, sugar, baking soda, salt, cinnamon, ginger and nutmeg. Combine pumpkin, beaten egg, oil and milk in a medium bowl. Make a well in dry ingredients; add pumpkin mixture and stir until just combined. Fold in chopped cranberries. Fill muffin cups and bake for 22-25 minutes. Why should the kids have all the fun this Halloween?! Whether you're manning the door passing out treats, or on trick 'r treat duty, you can treat yourself after the kids are in bed. This candy corn concoction is a genius answer to Halloween envy, and just for the grown-ups. It might not be on my diet, but for Halloween I'm dressing up as someone who drinks their calories and doesn't care! Infuse the vodka: Combine the candy corn and vodka in an airtight container; set aside for at least 3 hours, then strain. Make the cordials: Add 4 ounces of the candy corn vodka, the orange liqueur, lemon juiceiand egg white to a cocktailishaker filled with ice. Shake vigorously for at least 30 seconds. Strain into 2 chilled martiniiglasses and garnish with candy corn. Every fall I'm tempted by the Starbucks pumpkin spiced latte. Apparently I'm not the only one, word is the coffee chain is having trouble keeping the fall favorite in stock. But at $4 and 400 calories for a grande, I'm a little unsure if its worth all the fuss. I thought I'd try my hand at making my own more healthful version. To make youriPumpkin Spice Syrup mix together your pumpkin puree, cinnamon, ginger, cloves, nutmeg, and agave in a pan and stir until it begins to boil. Set aside.iMake some strong coffee….heat the milk and add into coffee. Mix ini2-3 Tbs of your Pumpkin Spice Syrup until you achieve desired sweetness. Enjoy! Wondering what to do with all the apples you've collected apple picking this past weekend? I'm going to be whipping up these super simple apple pancakes tomorrow morning for brunch. Yum! In a bowl beat the eggs until frothy.iAdd the flour, the 1/3 cup sugar, baking powder, baking soda, salt, cinnamon, ginger, nutmeg, buttermilk, butter and vanilla. Stir just until smooth and no lumps of flour remain; do not overmix.iAdd the grated apple and stir just until combined.iHeat a griddle over medium-high heat until a few drops of water flicked onto the surface skitter across it. Lightly spray the griddle with nonstick cooking spray.iFor each pancake, sprinkle 1/2 teaspoon sugar on 1 apple slice and place on the griddle. Using a batter dispenser, dispense about 1/3 cup of the batter on top of the apple slice. Cook until bubbles form on top and the batter is set, about 2 minutes. Using a spatula, flip the pancakes and cook until golden brown on the other side, about 2 minutes more. Keep warm until all the pancakes are cooked. While I can be a sucker for a spa day, I'm always concerned about the hidden chemicals in the products they use. I'm super careful about what I eat so shouldn't I care about the kinds of things that I'm putting on my face? That's why sometimes its best to stick to what you know. Your own refrigerator is chock full of all natural beauty treatments, so why go out? Here are some of the best all natural beauty remedies, and they won't cost you a calorie! Brown Sugar - Great natural exfoliantifor sensitive skin. Avocados - Reduces signs of aging, environmental stress, irritation, & inflammation. Olive Oil- Nourishment for skin and nails, shine for dry damaged hair. Lemons - Disinfectant, deodorizer, astringent, body cleanser, skin and hair lightener.They do it all! Oats - Relives skin dryness. Coffee - Contains Vitamin E and magnesium, exfoliant & tightens pores. Sea Salt - Remedy for dry skin. One of my favorite things about this time of year is finding new pumpkin recipes that I spoil my kids with. But for me, I prefer to find less indulgent ways to celebrate the season. This recipe satisfies my sweet tooth while staying on diet. Thanks to "Style & Grace" for this gluten free shake! Summer sure was a lot of fun. I got some much needed R&R. But I'm so exicited to be back for fall and have some really exciting posts lined up for the coming weeks so stay tuned. Here's to a wonderful fall filled with new Dayly's! Cheers!!! I recently become obsessed with the acai bowl, a delicious fruit and granola dish that features the acai berry. This refreshing breakfast treat can be found at every smoothie shack in Hawaii and Southern California, but if you're on the east coast like me, you've got to improvise. Here is my own simple recipe.iGive it a try! If you live in New York or you've ever visited New York, I'm sure you're familar with Sarabeth's Restaurant. She has several locations and each and every one has a brunch crowd that you wouldn't believe! If you haven't had the chance to visit one of her restaurants, perhaps you've purchased one of her scrumptuous jams, jellies, or cookies. Last week, I was fortunate enough to attend a luncheon in honor of the release of the new Sarabeth's Bakery Cookbook. Sarabeth Levine herself gave some amazing cooking tips and made scones fit for the queen herself! Here's Sarabeth's award-winning Upper West Side Restaurant. Seeing Sarabeth in action was something I'll never forget! One thing that she talked about that I LOVED and thought about a lot was about teaching the kids how to use the stove safely and properly instead of just saying "get back, it's hot and it's dangerous!" Here's an image from the cookbook of the finished product Currant Scones that Sarabeth is rolling out in the above picture...yum! This tapered rolling pin is a MUST according to Sarabeth. It's available at Williams Sonoma for only $14.00! Visit Sarabeth's blog to see when/where she'll be signing her cookbook and doing cooking demonstrations and for other fun tips and recipes. I just so happen to know that she will be at Lord & Taylor in NYC today. If you're around, go check her out! You can also purchase Sarabeth's products on her website. They make for great gift ideas-and just in time for the holidays! Food For Thought - Maybe Nate's Mom Made Cute Food for Him? As seen in the KITCHEN this volume, my daughter always eats our homemade popsicles. Although sometimes I wish she could eat popsicles for every meal, the mother in me tells me that's NOT ok. I must admit that I have considered a spinach popsicle, but I can't figure out a way to make it a different color! What is it with kids and the color green as related to food that makes them go "yuck"? There should be a study! I wonder if Nate's mom had this much trouble getting him to eat something green? My daughter is definitely a very picky eater so I'm constantly trying to come up with new and innovative ways to get her to eat. Here are some fun things I've seen in my research. Above: Panda Pancakes! I might skip the chocolate smile because if I know my daughter, she would lick it off and say, "I'm all done!" Other than that, these would make for a fun and delicious breakfast. The Nick Junior website has such fun recipes based off of their many children's shows (all of which I've memorized the theme songs to). Left is a Diego-inspired veggie snack and right is a healthy fruit depiction of Tasha from the Backyardigans. 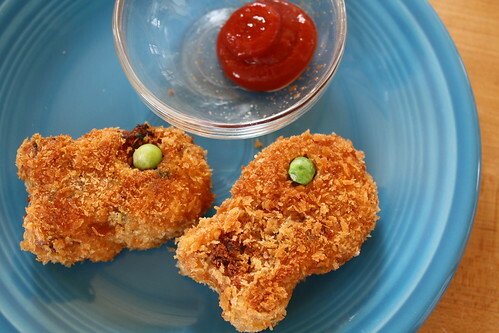 So while we may ooo and ahhh at the look of these crispy aquatic treats, my daughter would never eat them without the ketchup, that's why I use Annie's Natural Organic Ketchup or Organic Ville Organic Ketchup, which is sweetened with Agave. There have even been studies that show that Organic Ketchup can help prevent against certain cancers. For more information on this, just google "organic ketchup". You will find plenty! My daughter absolutely loves hummus, it's my "go to food" for her. I love the idea of doing something fun like "hummus pizza" to make it different. So cute AND it's organic!...getting her to eat the olives, now that's a different story! Maybe Nate's mom cut his into shapes of furniture that he could rearrange around the plate? If you've seen the Kitchen in the current issue, you know that I'm a huge advocate of feeding my daughter healthy popsicles. She loves them and I love that she's eating something healthy. But what about us adults? With Summer approaching, I found some tantalizing recipes for popsicles that grown-ups can enjoy too! The above popsicles are Margarita Popsicles! Click here for the recipe. This Bellini Pop has peaches, sugar, lemon juice, and Prosecco. It's like your own little slice of Italy...on a stick! These hip Martini Popsicles can be found at At Beverly Hills Hotel and Bungalows’ Bar NINETEEN12. Although, at $20 a pop (pun intended) I might have to try and coin my own version! These Lemon-Vodka Cream Pops sound a bit decadent to me, but when you're in a "let them eat cake!" kind of mood, they sound like the perfect treat. For those health nuts out there, or those who want a frosty treat in the middle of the day and don't abide by the "it's 5 o'clock somewhere" philosophy, try these delicious Protein Smoothie Popsicles. They sound like the ideal treat for a post workout cool-down!